Imagine you are the poet. After all these years, it turns out the pure conversion of your thought into art seems destined never to occur. You know this is true, and yet, and yet — you remain you and your words will not cross that bridge between worlds until they come to it. I wrote them, thought they were me. in the underthought of language. Creeley is not only a supreme master of common sense; he is a supreme master of the language of common sense. He has the gift of saying things which no one can misunderstand and no one can forget. His common sense is what its name implies, no private possession thrust upon the minds of others, but (this is the uncanny aspect) their own thoughts expressed for them. This is one of the secrets of the unique trust his words inspire. A purposive writer, he knows it is the purpose of a writer to be read. The jury — readers — give him their verdict because he always puts the issue on a basis they can understand. Harry’s gone out for pizza. Mother just left for Ibiza. Give the old man a bone? Remember when Barkis was willing? When onions grew on the lawn? When airplanes cost just a shilling? Where have the good times gone? The oldest originating motives of poetry are remembered in its memorial function, keeping green the memory of time, words thus finally and poignantly making a forlorn last stand against ruin in the courage to say one lived these moments. nor seemingly knew you before. I could not compare you to anything. sudden rain in the street. to yield one’s own despair. The echoing commonplaces in the ten-part sequence ‘Pictures’ run from old ballads to David Copperfield to ‘Dover Beach’ to Donne’s Holy Sonnets, the submerged histories of the subtexts flowing through the cycle like a subterranean river. Why does it stay there? Of person who was here? Gathering together into a sentence or line some piece of the common stock of wisdom or observation and applying it simply, directly and unanswerably (so nimble is the wit) to some immediate business at hand — is there anything that relieves the old argument of the poem so well? disappear. I will sit here. The writer of this commonplace language is at once recognized as no fabricator of ornamental phrase, no victim of cloudy speculation, neither self-deceived nor the deceiver of others. Creeley’s dogged veracity, his instinctive fastidiousness, his seriousness of intent, and above all his steadfast refusal to stop thinking, feeling and remembering, bring to mind some ancient and exacting sense of the poet’s office. One thinks of, say, Ben Jonson, who, annotating the title page of Puttenham’s manual on verse, echoed the Psalmist, as the hart panteth after the water brooks, to hint of the element of religious wonder in the poet’s thirsty pursuit of the poem. The thirsty hart in the forest’s heart is lost and found in a place of wonder. The gradual encroaching of the surrounding darkness can look like the cold void, or the heart’s forest: ‘Mind’s ambience alters all,’ Creeley reminds us in ‘Pictures.’ Thus the double specter, that of old age masking that of death, which haunts these poems. It is met with a surprisingly relaxed courage, facing an unsettling unknown which eradicates identities and names. a care facility, they will only die there. Everyone’s sick there. It’s why they’ve come. ‘If one were to think constantly of death the business of life would stand still,’ Samuel Johnson proposed. ‘So let it,’ might be one reply. To step away quietly from one’s name, a nimbus that clouds what it should elucidate, is a challenge to authorial survival. Was it Creeley of whom the saying went, on s’attend a voir un auteur et on trouve un homme? As he grows old, and, with age and an ‘authority’ of humanity, increasingly indifferent to criticism and confident in his vision of things, there comes an ease and familiarity, which, without diminishing the lucidity of the rhythmic phrasing or slackening the articulate binding force of the syntax, brings a new intimacy and indulgence. The writing grows more like talk. There is the tone of indifference to social judgment of someone who is talking among friends, knows the power of language and enjoys using it. Stylistic tact remains as a private stock, a reserve of good sense. And the content stays ‘basic’ — ‘natural to man,’ as Marx identified the common biological realm that precedes the social. The ease of this late Creeley manner more particularly takes the form of a redoubled directness in the old appeal to common experience, or that of those natural indulgences of old age, anecdote and autobiography. Even if I am happier, I think, and older. and play with them while all the others sung? if it still wants to and as it proves still able. Sit down, says generous life, and stay awhile! pours out the rancid wine, and walks away. Waiting one’s turn to go is the common undertow in many of Creeley’s new poems. There is a poignant centering of interest on the gradual meditative preparation of the inner life for its ending, the tale of the former tragedy of the ego relenting, the old scenes of conflict now revisited quietly and without much ceremony to mourn the victims, or to remove the ancient bloodied weapons from the field. In a recent, belated elegy for Paul Blackburn, Creeley’s abiding theme of a ‘Puritan’ self-dissociation discloses a cruelty of consciousness as the original sin to which the flesh is heir. A vigilance that invites trouble — or, if it isn’t available, invents it — appears in that earliest Double of this poet’s writing: overcompensating, overcapable, the Mind, that is the wound and the knife. Of the late elegiac pieces, the most powerful, ‘Emptiness,’ commemorates the poet’s sister, Helen, who like him had moved in later years back to their family’s ancestral Maine locales. Creeley indicated — in a book we worked on together about The Genius of the American Common Place — that he’d studied the history of the concept and found that genius loci, a kind of immanent presence, ‘presumably local to the fact of place, and to the speech habits and patterns thereof, does seem about right in my case. It’s that language one imbibes with ma’s milk, as Olson used to put it. My mother’s people were all Maine people, they had specific ways of saying things, they spoke with a particular humor. It was a way of speaking I learned from my increasingly single parent, and my grandparents, and my uncles. The ways I place the world were thus given a form from early on. And in emotional moments I now find I increasingly return to that language that’s particularly local to my childhood and to the place where I was brought up.’ Thus that which is mourned in ‘Emptiness’ is not merely a beloved sibling but a way of life and the way of language — ‘an exquisite frame of words’ — that has defined and here memorializes it. Much is to be lost, yet by the end the poem’s lightly-touching mother wit and stabilizing laconic restraint have rescued much, as well. she might have been saying, I’m busy today. Go away. Hence then to be cremated, to reach the end and be done. Creeley has written in another late poem (from ‘Sonnets’) of the habits and fears that had long kept him apart from what he calls ‘common cause’ (‘just stupid / preoccupation common / fear of being overly hurt / by the brutal exigencies...’). In our book on the common he explained what he’d meant: ‘did one begin with an initial intent to help share in the common ills and exposures of other people? Was there some initial commitment to the needs and fact of others? And did one recognize that one was living in a common world that was having its absolute necessities quite apart from how one thought of them and/or how one responded to them — that the world insistently was the case?’ A sense we’re in the presence of ‘initial commitment’ to the world’s insistent facts provides much of the extraordinary pertinence of this new writing of Creeley’s, which I take to represent a bright flag snapping in a Down East gale, revealing an immanent spirit of poetry still animating and aerating the scene with its true colors. 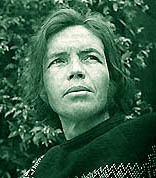 Tom Clark is the author of numerous volumes of poetry as well as of several critical biographies of writers. He teaches writing on the Core Faculty in Poetics at the New College of California in San Francisco, and lives in Berkeley. You can read Tom Clark’s biography, a detailed bibliography, a statement on poetics and a list of live links to all his pieces in Jacket magazine here, at Jacket’s Author Notes page.